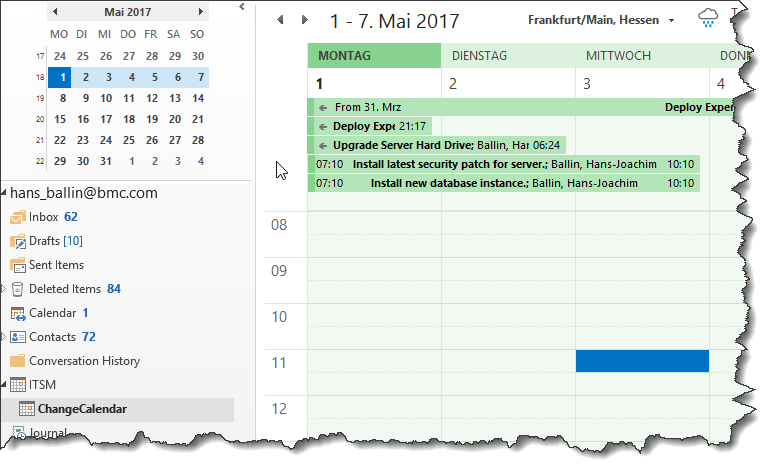 Die Anwendung btAnyCalendar2OL ermöglicht es Kalenderdateien (.ICS) automatisiert automatisiert in MS Outlook zu importieren. Normale Anwendung, kann in Autostart integriert werden. The application is waiting for appointment and task data file(s) to import it into MS Outlook. The application is waiting for an appointment file like “Export.ics” or a collection of appointment files (*.ics) in a specific folder. If the file is getting in, it grabs the file and creates/update appointments in MS Outlook. 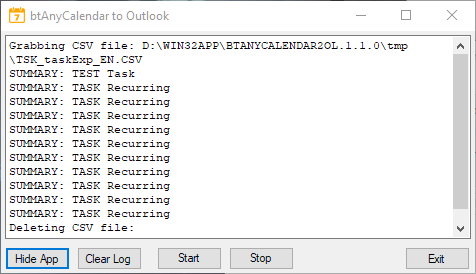 The application is waiting for an task file like “Export.csv” or a collection of task files (*.csv) in a specific folder. If the file is getting in, it grabs the file and creates/update appointments in MS Outlook. The application is locally installed and works in the background unattended. Install the application in any installation folder, configure and start it. The application assumes that the ICS Parameters are between the keywords “BEGIN:VEVENT” and “END:VEVENT”. Parameters outside this keywords are ignored entirely. Field not in use – it is a local timestamp, when the ICS file was exported. The UID will be used from ICS file to create a data record in OL and is used as a GUID. The GUID is stored in the “Billinginformation” field. By reimporting the ICS data, the same data are updated in OL. Export ICS file and store in in the specified location. After a while – 5 seconds typically – the application grabs the ICS file for data import. The data are imported into OL into the specified OL folder. Exit the application if required. One of the two methods “REQUEST” or “PUBLISH” creates an appointment. The working method is like as documented in chapter ”Working method – create/update appointments”. The method of “CANCEL” deletes an appointment. The “Internet Calendaring and Scheduling Core Object Specification” (iCalendar) supports all languages. The application assumes that the CSV data are created like a standard Outlook export process would do. "Subject","Start Date","Due Date","Reminder On/Off","Reminder Date","Reminder Time","Date Completed","% Complete","Total Work","Actual Work","Billing Information","Categories","Companies","Contacts","Mileage","Notes","Priority","Private","Role","Schedule+ Priority","Sensitivity","Status","MarkedAsDeleted"
The data must be real comma separated, no other separation character is currently supported. The CSV data owns no UID and therefore the application creates an own kind of GUID build by the attribute value concatenation of "Subject" and "Start Date". The GUID is stored in the “Billinginformation” field. By reimporting the CSV data, the same data are updated in OL. 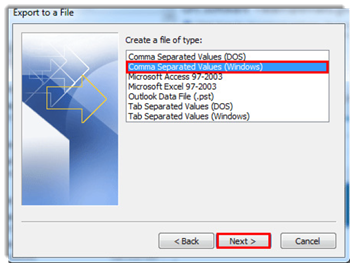 Export CSV file and store in in the specified location. After a while – 5 seconds typically – the application grabs the CSV file for data import. The application will create or update a task. Deleting a task is controlled by the attribute “MarkedAsDeleted”. A value of “Yes” or “Ja” will delete the corresponding task in Outlook. Furthermore the attribute value for “MarkedAsDeleted” will not be saved in Outlook. Tasks are exported in CSV data format from Outlook application. No other export formats are available and therefore only English and German language are supported for the data import into Outlook. How often the toll checks for ICS files. Service status is checked every 5 seconds, whether it is still running. It delays the process cycle to start or shutdown the service. A value of 10 waits 10 cycles before process will be executed. If value is set to “0” no main folder will be created. A value of “1” creates a main folder mailbox folder. If value is set to “0” no sub folder will be created. 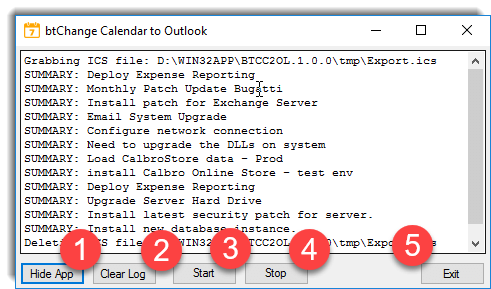 The folder will be created underneath the main “Calendar” if the value is set “OL_MainCalendar=0”. A value of “OL_MainCalendar=1” creates a sub folder underneath the newly created own main folder. Name of one OL Category. It is used in case the ICS file doesn’t provide such name. Specifies the prefix to be used for an exported data file. The folder where the exported file will be stored by the ITSM export function. The keyword of “App.Path” represents the installation folder. By using this keyword in the appropriate folder keywords the application will replace the keyword by the installation value by default. Alternative also a physical folder path may be used instead of “App.Path”. In this example the data were stored in a dedicated calendar path, because the default “Calendar” name did not provide permissions to write into this entry point. The application resides in the taskbar if minimized started. Double clicking on the calendar icon will open the main window. 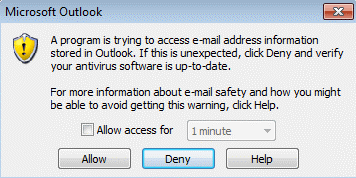 Q: An Outlook security warning window appears on the screen. A: This error message should preferably not appear, because this application uses a SNMP connectivity. By experience this error is related to missing user permissions OR not well configured anti-virus application. In example if the “On-demand” scan is disabled in McAfee this error is enforced. Übersicht der Benutzeroberfläche beim Import von Aufgabendaten (Beispiel).